You’ll never be the next Tiger Woods or Rory McIlroy if you don’t get to practise your swing. Getting to a putting green can be hard work especially if your schedule is jam-packed, so what could be better than having your very own surface to practice on, in the comfort of your own home? 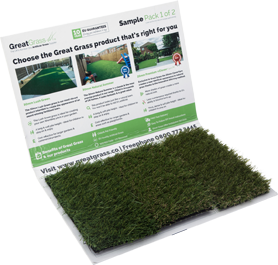 Here at Great Grass, we not only supply artificial grass to be used as lawns, but can supply you with your very own, personalised Artificial Golf putting green. Whether you want it indoors or outdoors, you can practise all kinds of golfing skills at your convenience. Installing your own personal putting green means you’ll have no excuse to slack off and you should be a pro in no time! Because we know everyone will want something different, our artificial putting greens can be cut to your custom design. So whether you want a simple flat putting surface to hone your short game accuracy or a complex miniature golf course with sand bunkers and roughs, we can make it possible with our easy to install DIY artificial putting surface. As leading artificial grass suppliers, we’ve worked hard to make sure out artificial grass imitates a natural putting area as closely as possible. In fact, our artificial grass mimics real grass exactly, providing a firm surface that creates a realistic ball roll. To get started on your own artificial putting green, or to find out more about our artificial grass services, contact us today 0161 685 0071.